I finally got around to processing a few more photos from this past summer. 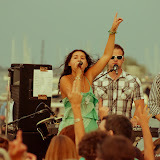 On July 19th I saw Sugar in concert at Esker Point Beach for the third year in a row. Once again the band did not disappoint! My photo gallery from last year's concert is probably my personal favorite of all my work. And, while I don't know that this year's gallery is up to the same standards as last year I do like it a lot. Here are a few of my favorite shots from the 2012 Sugar concert. Enjoy! You can also see the pics on Facebook here if you wish. A great venue for a concert! Most (but not all) of the fans were thrilled by the loud, upbeat music. Israel recognized me because of my photos from last year. Don and Shelley drew a crowd of their own when they showed off their cha-cha skills during a brief intermission. Categories: "Beach", "Concert", "Connecticut", "Esker Point Beach", "Groton", "Sugar"